The Golden Globes are commonly known as the loosest celebration of the awards season — but new security policies had guests waiting up to three hours to hit after-parties on Sunday night. Those attending soirees held by the likes of HBO, The Weinstein Company and Fox were told to report to a parking structure in Century City to board shuttle buses to the Beverly Hilton — as opposed to the longstanding luxury of being dropped off directly in front of the hotel. The result was a massive, hours-long line for what would normally be a two-minute drive on Santa Monica Boulevard, and a crowd full of First World anger. “This is like waiting to get off the Titanic,” said one female guest, leaning on her plus one’s shoulder with her stilettos in hand. “He just won Best Drama, but it’s cool, his family will wait,” said a peeved person in line, presumably a guest of Globe winner and “Mr. Robot” showrunner Sam Esmail. Rumer Willis, reality star Whitney Port, “Mad Men” star Ben Feldman, “Scandal” star Guillermo Diaz, David Wain and “Mean Girls” alum Daniel Franzese all toiled in line as well. “I feel like I’m in a prison junk yard,” complained “The Whispers” star Milo Ventimiglia. “Fuller House” actress Jodie Sweetin, “22 Jump Street” actress Amber Stevens West were also seen waiting in line. 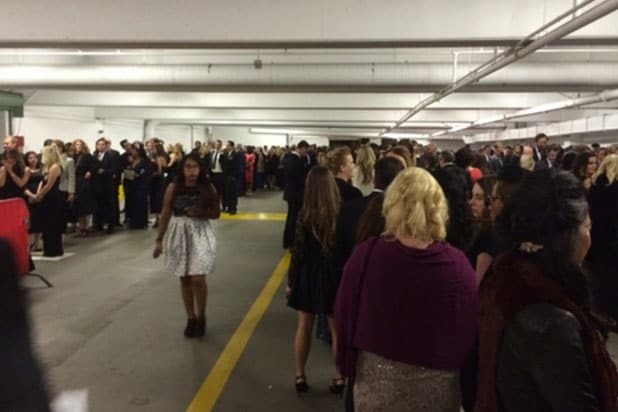 The line extended to the third floor of the parking structure, and barely moved for at least 90 minutes, prompting totally reasonable reactions like, “I’m going to end it all,” from a tuxedo-clad gentleman driving at five mph past the line. Women took off their stilettos after hours of standing, ignoring the dirty parking lot floor, while cars trying to enter and exit the lot weaved through waiting partygoers trying not to hit anyone. Opportunistic line-cutters were called out and bounced immediately by security. As part of the stepped-up security measures, the parking structure had four metal detectors to screen attendees before they funneled into a narrow hallway that dumped guests out on the street to board shuttles that could only accommodate around 20 people per car. What’s more, the line for the shuttles arriving at the venue stopped way before the red carpet, so people had to trek uphill along a driveway to the mouth of the Beverly Hilton hotel. Drivers of these shuttles were probably a little overwhelmed as well, seeing as one driver slammed the door on a security guard trying to direct traffic. Once enraged and tired guests finally arrived at the Beverly Hilton, they were met by security guards carrying machine guns and half-empty ballrooms. Most people arrived three hours after the broadcast concluded. The Beverly Hilton and the Hollywood Foreign Press Association have not yet responded to TheWrap’s request for comment. Purgatory is a shuttle bus to the golden globes after party. The line for the Golden Globes shuttle looks like The Human Centipede part 500. It is endless and barely moving.